Gremolata might be your new favorite condiment. Gremolata is a classic Italian garnish made from ingredients you might already have in your kitchen: lemon, garlic, and parsley. A spoonful or two on top of meats or vegetables gives foods bright, fresh flavor. We roasted thick slices of cauliflower so they taste sweet and hearty, then top these “steaks” with gremolata. Choose a nice, large head of cauliflower for the best results. If you can’t find a large enough cauliflower to cut into thick steaks like this, I recommend cutting it into florets and roasting as directed below. Pro tip: Keep an eye on cauliflower near the end of the cooking time to prevent burning. Brown, caramelized edges taste wonderful, but once they burn, they’ll taste charred. Trim 1-inch off end of cauliflower, leaving stem intact. 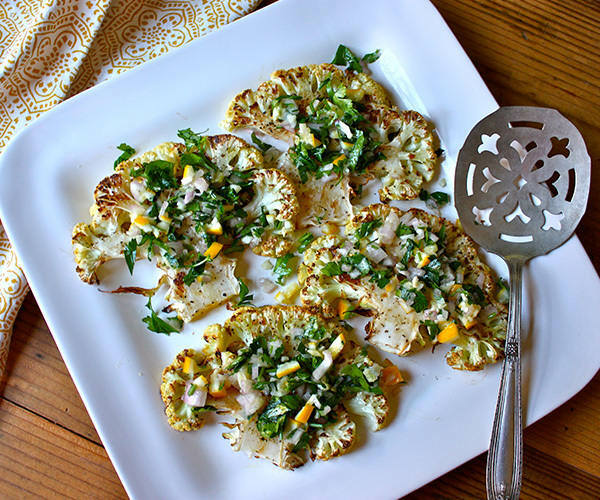 Cut cauliflower into four ½-inch thick slices. Place cauliflower on a large baking sheet. Drizzle with 2 tsp. oil. Season with ¼ tsp. salt and ¼ tsp. pepper. Top with lemon slices. Bake for 20 minutes. Turn with a spatula. Bake for an additional 10 to 15 minutes, or until cauliflower is tender-crisp and browned. While cauliflower is baking, combine remaining 2 tsp. oil, chopped lemon, parsley, shallot, garlic, remaining ¼ tsp. salt, and remaining ¼ tsp. pepper in a medium bowl; mix well. Top each cauliflower steak with 1 heaping tsp. of lemon mixture.